Being in a half Korean household, my tot loves kimchi. One day, he just stared at me eating some kimchi dish and said he wanted to try it. As it's spicy and salty, I washed it and gave him a tiny little peace and he absolutely loved it! He does have Korean in him. Haha. It's funny, when it comes to food, he's just like me. Not afraid of trying new things and he likes things I like. I remember my mom saying she's so lucky I am a good eater when I was young. I hope I can always say that about my tot. 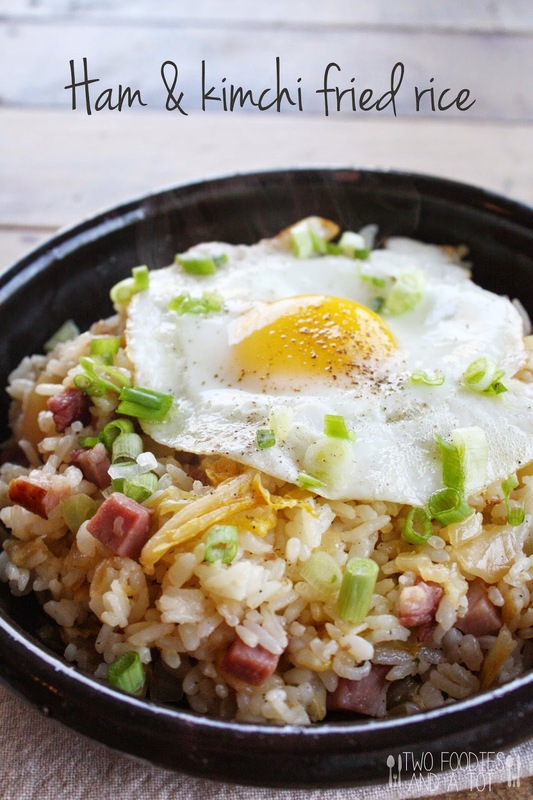 Kimchi fried rice is one of the most popular comfort foods for Koreans. If it's just me, I would make it with spicy kimchi with a drop of gochujang(red pepper paste) but since I was sharing with my tot, I thoroughly washed kimchi and cooked it. Sometimes I like that mild flavor. My gosh, just writing and thinking about it makes me hungry. 2. Heat the vegetable oil in a skillet and saute onion until translucent. Stir in kimchi and ham to it, and saute for 3-4 minutes. 3. Add cooked rice and sesame oil. Make sunny side up eggs at this point. Stir the rice constantly so that it doesn't stick too much to the skillet. Season with salt and pepper. Cook for 2-3 minutes. 4. 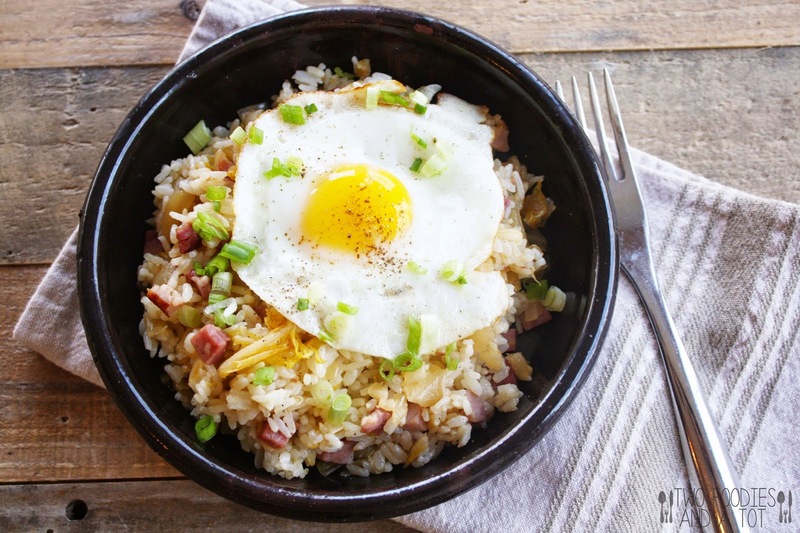 Plate the rice and top each bowl with a sunny side up egg and chopped scallion. Serve immediately.